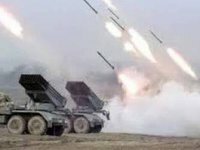 Illegal armed groups conducted 34 strikes using mortars, artillery weapons and Grad multiple-launch rocket systems against positions held by Ukrainian soldiers last night, the press center for the anti-terrorist operation has reported. According to the report, the most intense shelling was observed near Donetsk. Luhansk Regional Governor Hennadiy Moskal, for his part, said that shelling of Kyiv-controlled parts of the Luhansk region has become much more intense since January 8. "The main hot spots are Krymske, Stanytsia Luhanska and Schastia," Moskal said. Gunfire exchanges can be heard virtually non-stop in Stanytsia Luhanska, Moskal said. "The outskirts of the town of Schastia came under intense artillery fire at around midnight. No damage was caused to its infrastructure," he said.